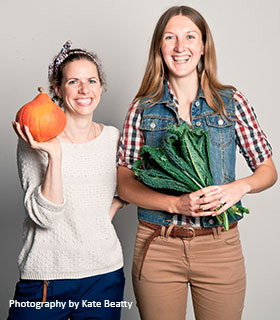 When fate threw Sarah Bentley and Joshana Lovage together in summer 2011 to compile a Big Lottery funding bid to launch the Made In Hackney - Local Food Kitchen, it was a meeting of two determined personalities with a passion for making healthy, sustainable, local food available to all. Joshana is the daughter of Meeta and Govinda Lovage who set up not-for-profit health food shop Food For All in 1976, the basement of which Made In Hackney resides. Jo has a deep connection to 3 Cazenove Rd having lived above the shop as a child and later managing the health food shop. In 2009 she joined an AMURT UK project in Kenya serving small villages with homeopathic medicines and training in homeopathic treatment. Today Jo works part time at Homerton Hospital Psychiatric Ward and is studying to become a Medical Doctor. Sarah was introduced to AMURT UK via her Permaculture teacher Rakesh Aji who is part of the Ananda Marga meditation group. Sarah joined forces with Joshana to develop the project and with help from the wider AMURT UK, Ananda Marga and Food For All family put together a successful Big Lottery Local Food bid (awarded June 2012) that kick-started Made In Hackney. The dedication of this extended family to see the project happen became evident when a week before the kitchen was due to open the builder left the job in disarray. With no more funds to pay a new builder friends, family, customers and AMURT UK members rallied to complete the work. Day after day, night after night they grouted, tiled, sanded, and painted and in doing so produced the beautiful community kitchen Made In Hackney is today. In 2009 former reggae journalist and university lecturer Sarah Bentley had a conscious awakening. Questioning the impact her writing was having on the issues she cared about she embarked on a period of learning. She read books on the global food system; watched documentaries about the banking crisis; helped build cob houses in eco communities; learnt to grow food; became a passionate advocate of organic; started writing for The Ecologist; took multiple Permaculture courses; did an apprenticeship at 38 Degrees; took part in grassroots environmental activism (well, tagged along with 'real' activists to blockade an oil rig for the day); became a growing apprentice at Growing Communities and had a life changing conversation with Indian activist Vandana Shiva. These experiences landed Sarah at the heart of London's thriving organic, local food scene - a movement seemingly about growing your own but Sarah believes is, as the permaculture saying goes, 'A revolution disguised as gardening.' "By working on re-localising food systems you're having a positive impact on a huge range of issues - food poverty, inequality, climate change, reducing corporate control of our food, health and wellbeing - it's a hugely inspiring and rewarding area to work in." Nynke is a long time Hackney resident and serial networker. Passionate about supporting local community causes with Made in Hackney she found an enterprise that met all her expectations - promoting healthy eating, supporting urban food growers and working in her community. Previously Nynke worked for Greenpeace on a campaign tackling the illegal destruction of rainforests for conversion to cattle grazing and soya plantations, which highlighted the necessity to return to a more localised and sustainable food system. Nynke is a certified career coach and has worked for the charity UnLtd, where she set up a business mentoring programme to support social enterprises like Food Cycle and Growing Communities. She also managed the North London Master Gardener programme, an initiative of charity Garden Organic, that connects volunteer urban food growers with community health and wellbeing projects, to encourage people to 'grow their own', a cause that has many synergies with Made in Hackney. Veryan started her career as a production manager in magazine publishing, before discovering a passion for food, all things community and, more recently, healthy eating. In her previous role, she headed up a community project at Sutton Community Farm to encourage healthy eating, involving cook clubs, pop-up stalls and banquets. Veryan is a proud former member of the Crystal Palace Food Market team, where she coordinated the kids activities for this fantastic Transition Town project. Veryan enjoys cooking for friends and family, often trying out new recipes and ideas. She had a stint a few years ago working as an artisan cake baker, trading at local farmers markets, together with her husband who bakes sourdough bread. Veryan loves what Made In Hackney is all about, and is delighted to be part of an amazing team here! After graduating in Accounting and Finance in 1992 in Manchester, Jayshree completed her professional accountancy (ACMA) in London. Initial work included implementing the first digital accounting system for a bus manufacturers in Wigan, then onto London and gained financial analysis and modeling experience in start ups and projects in various sectors including events, retail, online retail, interactive television, media and the Government Department of Health. In 2006 Jayshree stepped off the working wagon for motherhood and has never looked back (maybe odd peek over the shoulder now and again). Motherhood got Jayshree interested in cooking at home and the use of good ingredients. Jayshree is a daughter of a cook and comes from a family of farmers in India so influence of food was always there. She likes the fact Made In Hackney is a new project about vegetarian food and regards Made In Hackney as a great re-introduction into the world of work. Despite having an Agricultural Economics degree, Dilupa started her career in the world of media and advertising. She's still not quite sure how that happened. After working for over a decade in sales strategy for media owners in newspapers, magazines, TV and radio, she decided to go freelance in 2014. Using her marketing and sales skills in tech start-ups, education, property development and even gym & spa management, Dilupa finally made the breakthrough into the charity sector with Made In Hackney. She has a passion for cooking and baking, and is always willing to learn something new. Which led her to Made in Hackney and their classes on Fermentation and how a healthy gut can lead to a healthy body and mind. Dilupa was really looking to work with an organisation that can do good, and puts that into practice every day. Fran has always had a passion for the environment and started her career in tropical marine conservation. She previously worked as Conservation Director for Blue Ventures Conservation working with fishing communities, in countries like Madagascar, supporting them to secure their livelihoods for the future. It was this passion for both people and the environment, and the desire to work more closely with local communities in London that made Made in Hackney the ideal organisation. She also has an unhealthy love of preparing budgets and financial reports which is perfect for this role. Outside of work Fran would most like to be whale watching but is more likely to be building her green credentials by attempting to garden, grow vegetables or cooking new recipes passed on from MIH! My career path now took a different course. In 2015 I started doing voluntary work for MIH working in the kitchen and helping with various projects such as Single Homeless People's project, people with visual impairments and local community centers. This allowed me to use some of my degree knowledge to help people to understand local, seasonal, affordable cooking. My aims in life are to use my knowledge and skills to educate people about food and well being to enable people to take control of their health. Mark loves showing people how to cook what is at its best at any given time. His passion is teaching people to cook with skill and enjoyment to create beautiful and tasty dishes that are good for our taste-buds, bodies and soul. Mark is a classically trained chef who believes that learning to cook together can bring communities together as well as improve people’s health and the environment. When Mark isn’t with us or working as a private chef, he’s usually in the kitchen at home tinkering with ferments and pickles. Amy is Made In Hackney’s multi-talented in house chef, artist, social media adviser and cover staff. She is particularly fond and good at working at pensioners events, making mince pies and producing kale crowns for social media campaigns. Amy is a former music teacher and professional cake maker and continues to be a world traveller and communications expert specialising in social media and content creation for charities and inspiring causes around the globe. Zoe is a community class teacher at Made In Hackney where she likes to cook hearty, unpretentious and flavoursome food. She says working for Made In Hackney is the most rewarding job she has ever done. “I love the therapeutic and social aspects of cooking and the magic that happens when you bring different people together in the kitchen.” When she’s not leading one of our courses you can find her cooking at the Bonnington café - where she began her career as a chef 8 years ago. Cary is one of Made In Hackney’s uber volunteers – starting his MIH journey as a class participant and then getting more and more involved as a volunteer host, assistant chef and assistant teacher. He signed up to our classes initially after being treated for cancer and wanted to overhaul his lifestyle. Today he is now a passionate chef, juicer and kombucha maker – hoping to turn this into a career. Here he represents over 75 volunteers whom without MIH would not be able to do the awesome work it does. With a background in community engagement and environmental education work, Fi went on to work with Growing Communities - a community-led organisation based in Hackney working to create positive alternatives to the current damaging food system. Fi helps to run the box scheme at Growing Communities and also coordinates education projects teaching young people and their families about where food comes from. Cooking was an obvious off shoot from Fi's work and passion around food and the environment, and together with Ximena - also at Made in Hackney - and her partner Duncan, she set up the Hackney Growers' Kitchen. They run a weekly cake stall at Stoke Newington Farmers' Market and take on small catering jobs for community and environmental events. She loves to cook (and eat!) and loves to work with people...so as a result is particularly passionate about what food can do in terms of bringing people together! Two of my passions in life are food and comedy. I like to combine both in my sessions. My style of teaching is practical and fun. I've been cooking since the mid-70's which makes me quite old, but not as old as Mary Berry. My interest in growing vegetables happened quite by chance back in 2009, when I was coerced into being a volunteer at Spitalfields City Farm. I only intended on staying the minimum. To date, I'm still there and happily so, promoting wholesome and naturally grown food. Originally a textile designer, in 2009 narrow boat dweller and lifelong Hackney resident Ximena started volunteering at one of Growing Communities’ market gardens as the waiting list for allotments in Hackney was closed. A few sessions in and she realised growing food was what she wanted to do for a living. After completing an apprenticeship in salad growing, going back to college to study horticulture and allotment gardening, and completing a life-changing permaculture design course, she became a ‘patchwork farmer’ on two plots of land in Hackney. As a patchworker she sells ‘zero food miles’ salad to Growing Communities affordable organic vegetable box scheme. Next she became the infamous GC’s veg box deliverer cruising around Hackney in an electric milk float disguised as a cow dropping veg off to the schemes various pick up points. She became interested in making preserves with the box schemes leftover produce. Teaming up with her patchwork farm colleague and North London Action on Homeless, they started selling jams and chutneys at the farmers’ market and at gardening events. Soon after she and three other food growers set up Hackney Growers’ Kitchen, using fresh organic produce from their growing sites, the box scheme and Stoke Newington Farmers’ Market. They now have a stall at the market, and cater for events for environmental and socially conscious organisations. She finds sharing her knowledge of cooking and growing food locally with the wider Hackney community extremely rewarding.